You sure remember their gigs in 2004 and 2006!!! WASTEFORM are just a great live act and this has not changed. They are back in form after several years of silence just preparing a new record that will have its debut at our annual meeting of extreme conspirators!!! For 10 years Wasteform has been detroying the planet with their extreme speed and devastating breakdowns, hailing from the armpit of new york (albany) wasteform has been a well oiled machine that has left nothing but carnage in their path, in 2001 wasteform recorded a demo at sos studios (overbearing filth) ,it was raw and unpolished but it caught the ear of skinless frontman sherwood webber who was running stepup presents records with local promoter ted etol. Sherwood loved what he heard so much that he re released as a split with local bashers Traumaside. After seeing how the underground was eating it up he put out their first full legnth Crushing the reviled which then lead to them playing The newengland metalfest and the New jersey metalfest. 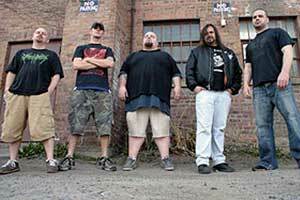 In 2003 wasteform signed with Xtreem records and released Ignorance thru sovereignty. Also that year wasteform was honered to play The obscene extreme fest in CZ REP and that launched a huge Euro fan base. After 4 successful euro tours wasteform rereleased their first full legnth (c.t.r.) with 5 bonus trax on nice to eat you records owned by longtime friend vlad prokos. fast foreward to 2010 wasteform is in maxx traxx studio's (skinless/recon ect..) working on their next album which will be released at Obscene Extreme 2010.